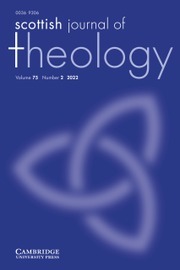 Scottish Journal of Theology is an international journal of systematic, historical and biblical theology. Since its foundation in 1948, it has become established as one of the world's leading theological journals. As well as publishing original research articles, many issues contain an article review consisting of an extensive review of a recent book, with a reply from the author. Scottish Journal of Theology provides an ecumenical forum for debate, and engages in extensive reviewing of theological and biblical literature.